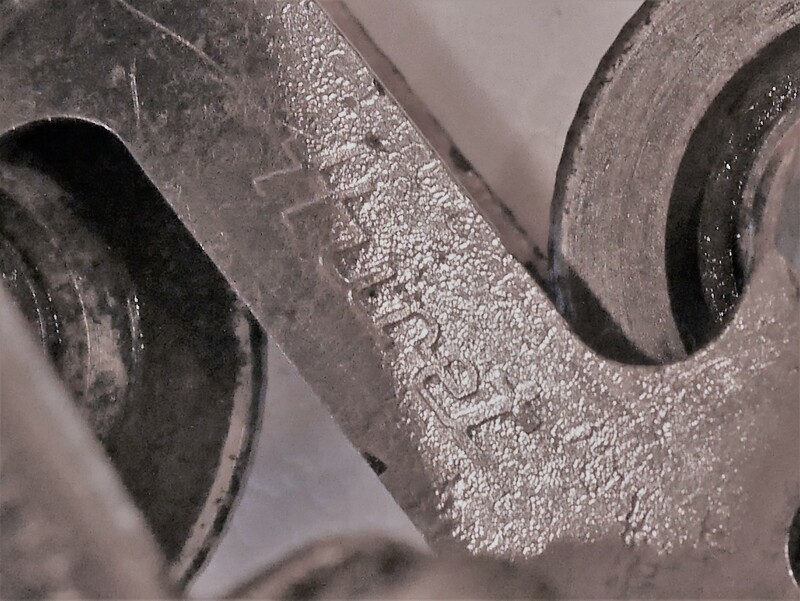 This Huret Competition rear derailleur was equipped on the Mercier Meca Dural bicycle I have been restoring. 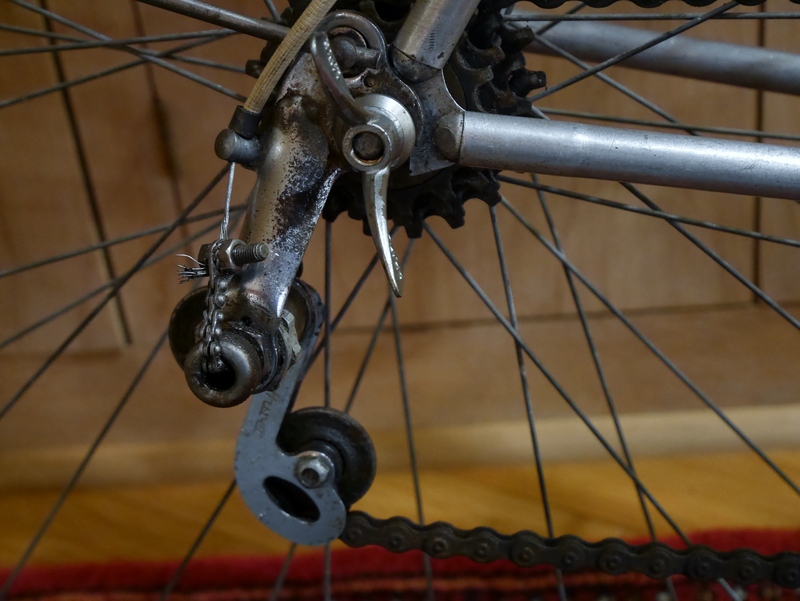 When I removed the derailleur from the frame, I wondered whether it was original to the bike. And, I really didn’t like it – with it’s rigid connecting arm and weird large upper opening which is supposed to connect to the space above the frame’s vertical drop outs. Perhaps I am a Simplex snob. 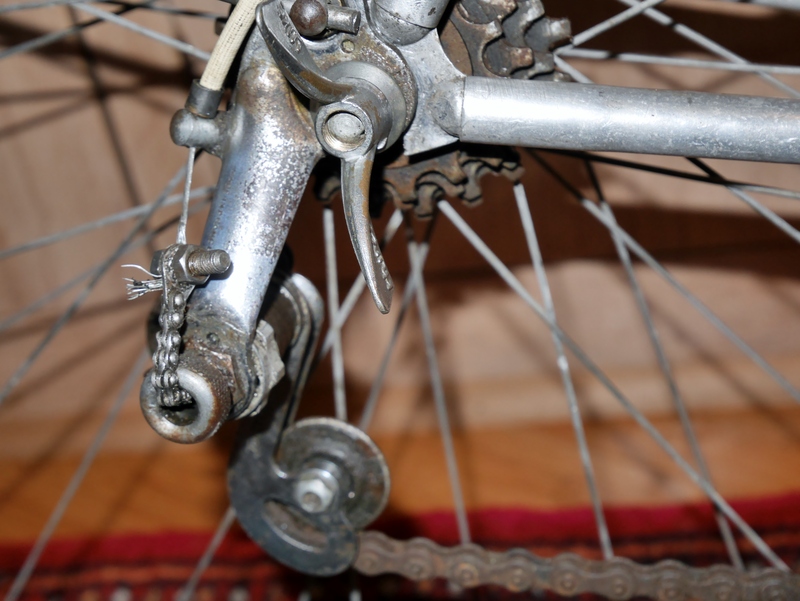 This plunger/pull-chain derailleur is similar to the Simplex TDF and Simplex Juy derailleurs of this era. 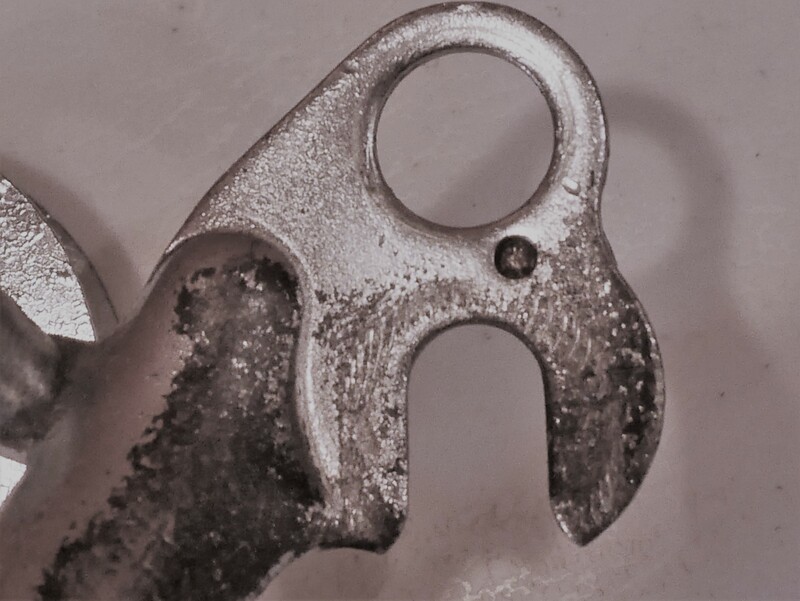 But there is an important difference: there is no upper pivot on the derailleur arm, so it cannot move under chain tension. 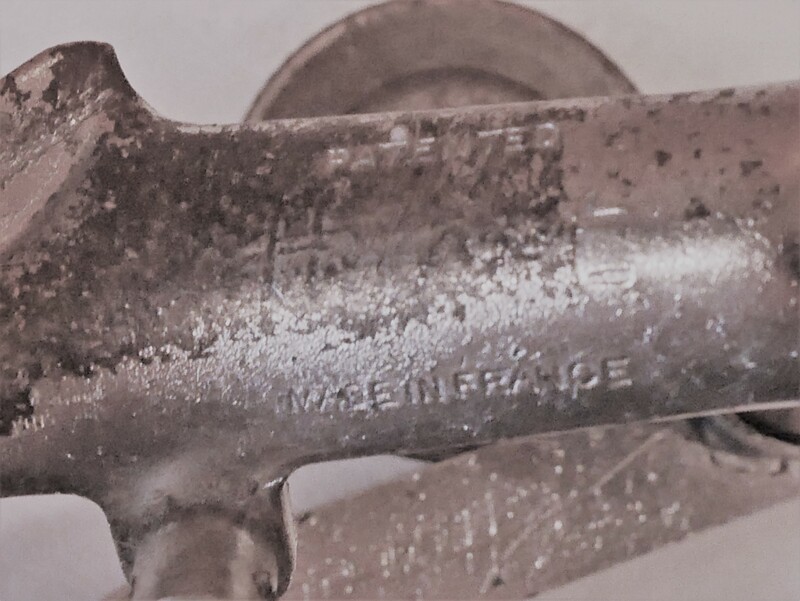 During this era, Simplex offered this extra feature on its plunger/pull-chain derailleurs, and I have enjoyed restoring a number of fine Simplex derailleurs from the early 1950’s which work well out on the road. Instead, this Huret derailleur mounts with a rigid arm extending from the chainstay. But because this Mercier Meca Dural has vertical dropouts, is the derailleur in the correct position? 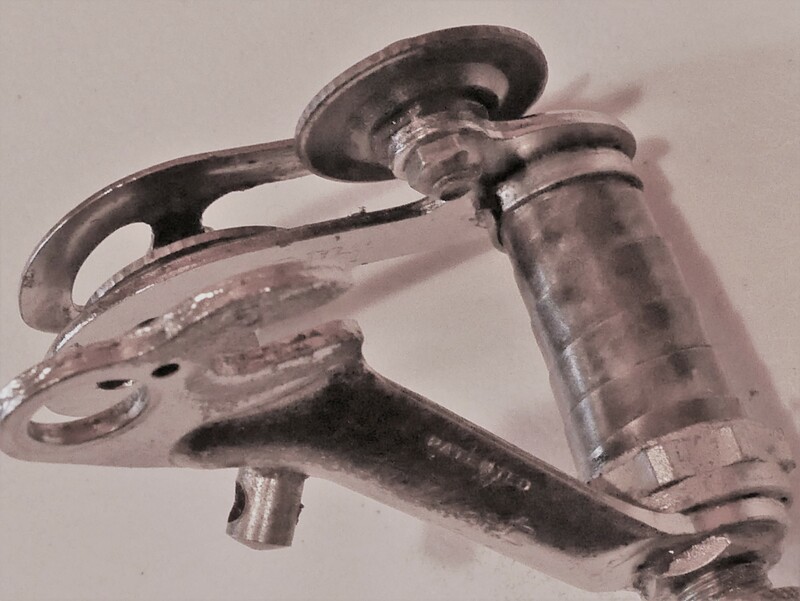 The Daniel Rebour drawing shown above shows this derailleur mounted on a frame with semi-horizontal dropouts. 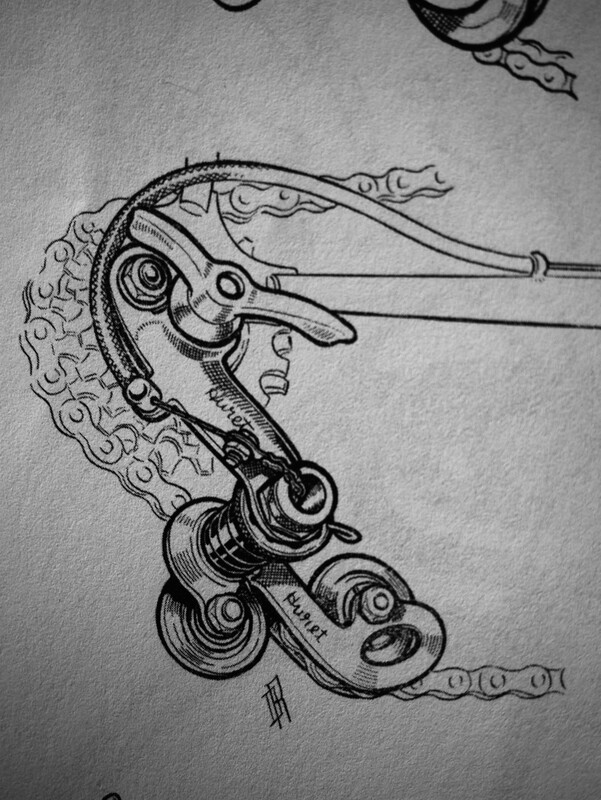 The position of the upper pulley in Rebour’s drawing, allows for more chain wrap, as opposed to my project, with its vertical dropouts pushing the derailleur down, with less engagement of the freewheel cogs. Even so, I decided to overhaul the derailleur and keep my misgivings at bay. 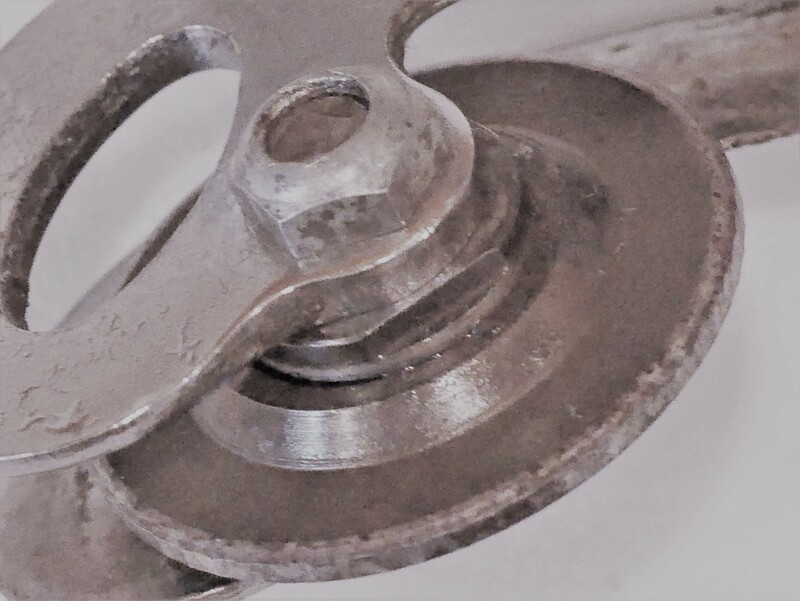 The pulleys have ball bearings – a really nice feature – which I overhauled by removing the pulleys from the cage, and cleaning and lubricating them. Each pulley has a set of cones under which the ball bearings reside, which can be tightened or loosened. I decided to leave the cone adjustment as found, but I did note that one pulley’s cones were quite a bit looser than the other’s. 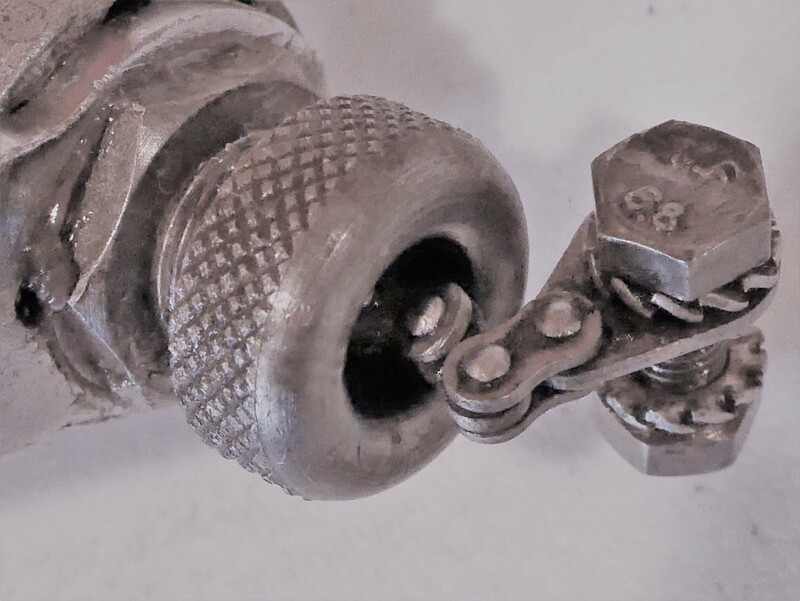 I also cleaned and lubricated the pull chain – removing it completely from the derailleur and, cleaning and greasing it, then re-threading it. The re-threading is a little challenging – it takes patience to get the threads to re-engage. I’m not enamored with this derailleur, but after researching its origins, I believe it may be original to the bike. Even so, I may decide to replace it with a nicer Simplex model from this same era. First, I’ll test this derailleur to see how it performs. 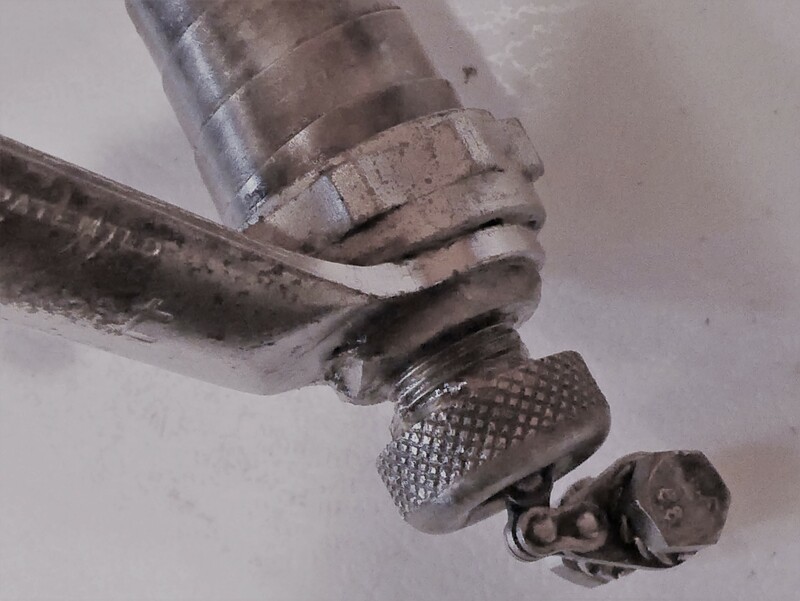 This entry was posted in Bicycle restoration, Meca Dural, Mercier, Vintage bicycle restoration, Vintage French Bicycle and tagged Huret, Huret derailleur, Meca Dural, Mercier, simplex Tour de France by Nola Wilken. Bookmark the permalink. 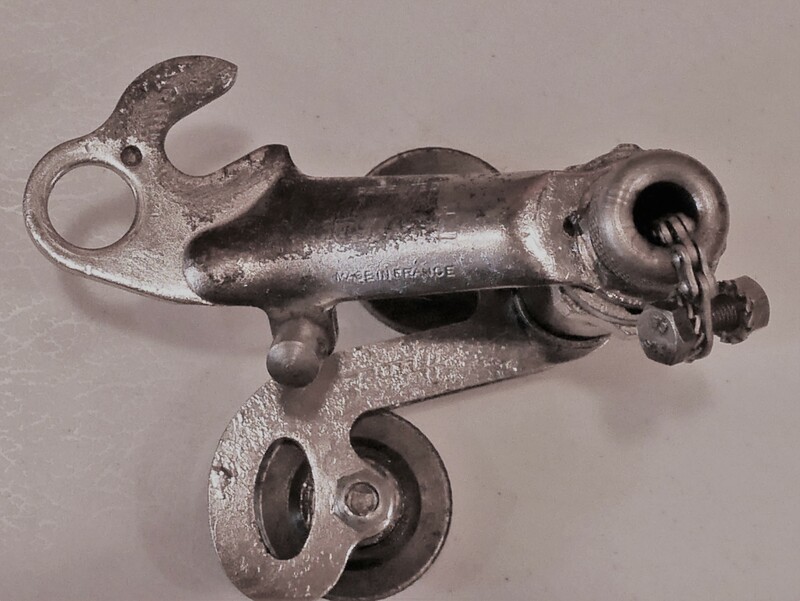 I just purchased a 1960 NOS Simplex juy rear derailleur for a Schwinn Continental. Doesn’t need any reconditioning looks great, thank goodness. The suicide front derailleur came with the bike. Not sure how it works since it doesn’t move very far. Interesting – good luck with your project! Jim, if there is a screw or something, try to take apart the gear section of the front changer. It may be caked with dirt. This would negatively affect the range of the “throw”. Ater one 9M ride in the rain, my Benelux was choked and I had to clean it. Nola, thanks for the good description of the pulleys. I didn’t know the pulleys on my Benelux Mk7 had ball bearings and was pleased to find that they do, so I overhauled them. Thanks for the tip. You said you are going to find a Simplex r.d. to put on the Meca Dural. Does that mean you are going to be using a 3-speed freewheel? (I think I saw a reasonably-priced Atom, recently, online). How does the leg feel?